The countries of Southeast Europe look back on an eventful two decades. The Balkan Wars and a difficult, slow process of transition from centralist states to democracy and market economy have left their marks on the region. The goal of all Southeast European countries has been, and remains, to catch up with the rest of Europe economically and politically. The past changes have also affected natural resource management in the region. Earlier, resource use was regulated in centralised sector policies that left no room for local populations to participate effectively in planning and decision-making processes. Today, agriculture and forestry are still significant economic factors. 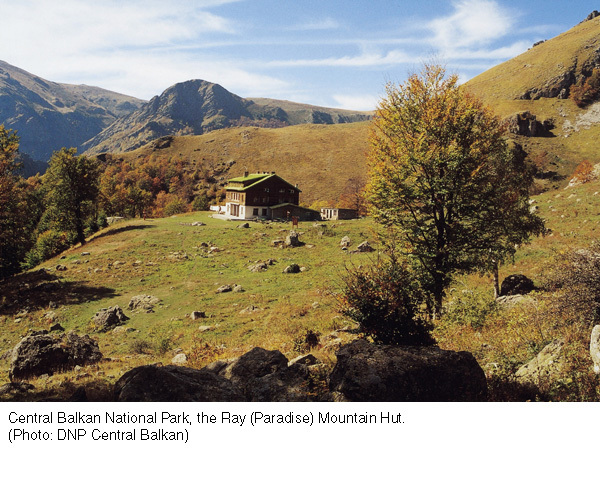 The Southeast European states are rich in precious natural landscapes and enjoy a high biodiversity. However, natural resources are increasingly under pressure. One reason for this is increasing intensification. Another reason is marginalisation of rural areas, which is partly due to shifts in the national borders after the wars. Transition and peace-building brought the region new opportunities for promoting sustainable resource use. The Swiss Agency for Development and Cooperation (SDC) began at an early stage to collaborate with local organisations in support of the transition process. Aside from natural resource conservation, projects were also intended to strengthen democracy and decentralised structures. In Bulgaria, for example, SDC has been active as of 1995 with projects to promote organic farming, forestry, and biodiversity conservation. 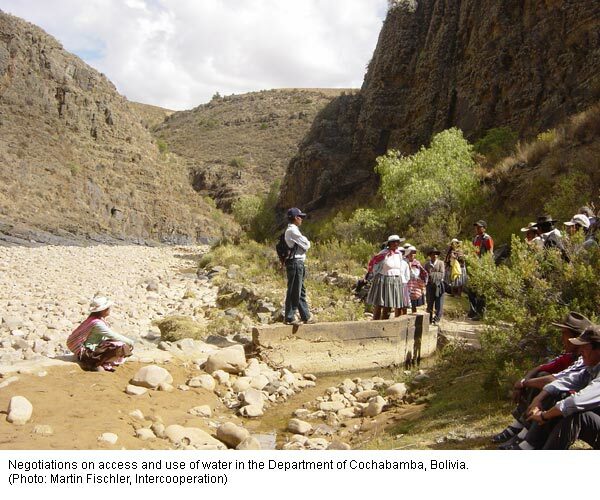 As of 2000, SDC has also been supporting three transboundary projects for the use of shared natural resources, which are designed to simultaneously encourage socio-economic development for the local populations. Participation of all stakeholder and actor groups from the local to the national levels proved an effective tool for supporting democratisation and served well to promote sustainability. Stakeholders were involved during the initial phase of problem identification and formulation of objectives, as well as later in the planning and implementation of projects. Joint planning for multifunctional use of forested areas in Bulgaria, for example, led to greater transparency in planning and decision-making processes and increased accountability and public control. In the transboundary projects, however, it was necessary first to rebuild trust and communication mechanisms between the participating states. The involvement of large groups of stakeholders also triggered joint learning processes, enhancing the capacities of the various actors and empowering them to intervene in decision-making processes. International conventions, agreements and standards, such as the Convention on Biological Diversity or the European NATURA 2000 strategy, proved to be important entry points for developing national-level legal frameworks. The authors conclude that long-term resource management projects are appropriate instruments for supporting democratisation and decentralisation processes. The well-documented experiences gained during SDC activities in Southeast Europe can benefit similar projects in other countries in transition. > Capitalisation of Experiences of the Swiss Support to Sustainable Management of Natural Resources (SMNR) in Bulgaria. Markus Giger, Dimitrina Boteva, Svetlana Aladjem, Heino Meessen. Swiss Agency for Development and Cooperation SDC and Centre for Development and Environment CDE. Berne 2007. 48 p.
The last eight years has seen the emergence of a greenhouse gas emissions market, mechanisms to lower the emission reduction costs, as well as greater cooperation between countries. All these developments have their origins in the Kyoto Protocol. Alongside this formal market, a voluntary market has gradually developed over the last two years. As the name suggests, it centres on the voluntary participation of parties which are neither associated with nor bound by specific regulations. This segment comprises institutions, governments and individuals who offset their emissions by investing in emission reduction projects. While literature on this subject is scant, this report argues, based on evidence, that the voluntary market enjoys greater flexibility in terms of sustainable development goals. As a result forestry projects are very popular thanks to attributes such as ecosystem services, biodiversity conservation and community benefits. However, it is not all good news. The report states that controversy dogs projects of this type, in particular those involving large-scale tree plantations due to the fact that they can greatly affect the ability of local communities to use these resources and may release stored carbon should a fire, illegal logging or other type of damage occur. The EU plans to increase the portion of biofuels in all transport fuels from the current 1% to 10% by 2020. At the same time, the EU is far from being able to produce the enormous amounts of ethanol and biodiesel required to meet this target. Its statement has therefore triggered a downright scramble in developing countries to meet the European demand. While Malaysia and Indonesia plan a rapid increase in palm oil production, Brazil intends to push sugarcane production. South Africa, Tanzania and Mozambique are making plans to join in on trade in biofuel. Oxfam points out that these expansion strategies frequently have disastrous consequences for poor rural populations. Many farmers are driven from their land. They are often forced to work on plantations in conditions similar to slavery. Others are pressured into unfavourable contracts and have to produce for large biofuel companies at poor conditions. Rising food prices due to competition for limited natural resources further aggravate the pressure on the poor. In conclusion, the authors call on the EU to give a higher priority to sustainability than to achieving the 10% target, as well as to define effective social standards for biofuels in addition to environmental standards. The biofuel boom must be prevented from increasing poverty in developing countries. The EU is currently in the process of signing so-called Economic Partnership Agreements with the 78 countries of Africa, the Caribbean and the Pacific (ACP countries). The aim of these agreements is to achieve an extensive liberalisation of trade among the signatory states. The authors document experiences with liberalisation initiatives launched by the IMF and the World Bank in Uganda, Zambia and Ghana, and show that local smallholders must expect negative consequences. On the one hand, they are frequently unable to benefit from improved access to the EU market: although they no longer have to pay tariffs, they can hardly meet the high technical standards required for products imported to the EU. Poor rural infrastructure constitutes an additional hindrance to market access. On the other hand, farmers experience the negative impact of opening ACP markets for products from the EU: imports of subsidised EU products threaten the position of local producers and processors on the domestic market. At the same time, the African states lose significant revenues from import tariffs, leaving fewer financial means for subsidising agricultural inputs and for programmes to support the poor. According to the authors, equal trade regulations for the EU and for developing countries can only be introduced once the developing countries have had the opportunity to improve their overall economic conditions. Source: Impact of EU’s agricultural trade policy on smallholders in Africa. Kerstin Bertow and Antje Schultheis. Germanwatch. October 2007. 66 p.
Farmers around the world are producing more and more food. This growing production is becoming increasingly detrimental to natural resources such as water or biodiversity, and to the climate. Until now, farmers have been paid mainly for the food they produce, but rarely for services that help to improve the condition of these natural resources. However, there is an increasing demand for such services. This is reflected in the growing number of projects to establish payment for environmental services (PES). In China, for example, farmers are now compensated by the state for planting trees on degraded land, and in Mexico private companies are paying rural communities to switch from agriculture to agroforestry in order to compensate their company’s carbon dioxide emissions. However, the authors show that PES programmes do not automatically benefit rural populations. It is not always easy for individual farmers to determine whether a change in production methods will pay off economically. Poor information, lacking technologies and required legal statuses can pose further hurdles for introducing new practices. Furthermore, PES programmes can lead to a decrease in salaries or rising food prices – circumstances that are particularly hard on the poor. All these concerns must be taken into account when developing projects. The growing vulnerability of societies is compounded by extreme weather events and additional uncertainties linked to climate change. Often, this means more work for humanitarian organisations. Faced with this challenge, the Red Cross and the Red Crescent have jointly produced a guide, with the aim of sharing the experiences gathered by more than 40 National Societies over the last five years in relation to tackling the effects of climate change. According to Tony Vaux of Oxfam, “People need information as much as water, food, medicine or shelter”. This claim is echoed in two chapters of the guide that deal specifically with how to enter into dialogue and communicate on climate risks. National Societies are first taught these skills before going on to promote dialogue between governments, local authorities, meteorological offices, universities, NGOs and civil society. They draw up checklists and a comprehensive series of steps to follow in order to initiate dialogue at these different levels. The National Societies also help with the introduction of preventive measures, early-warning systems, storm-resistant housing, tree planting and evacuation plans. Throughout the world, agriculture is confronted with increasing ecological, socio-economic and technological challenges. All actors have increasingly come to agree that these challenges can only be overcome if production is designed to be sustainable. While there is plenty of knowledge available on the subject, putting it into practice is not always easy. This is where measurable indicators play an important role. Sustainability indicators provide farmers with hints as to how they could optimise their production and achieve a more marked profile vis-à-vis ecologically sensitised consumers. Policy-makers can use indicators to deduce criteria for payment of environmental services, and the industry can refer to them for product quality improvement and risk assessment. By now a wide range of methodologies has been developed for measuring various agricultural sustainability indicators. If any one method is to become established, it must be holistic, easily and profitably applicable at the farm level, and politically effective. The International Forum on Assessing Sustainability in Agriculture (INFASA) has set itself the goal of promoting and coordinating the application and further development of methodologies for measuring sustainability. The report of the first INFASA symposium renders an interesting overview of methods and experiences against a wide range of different backgrounds. 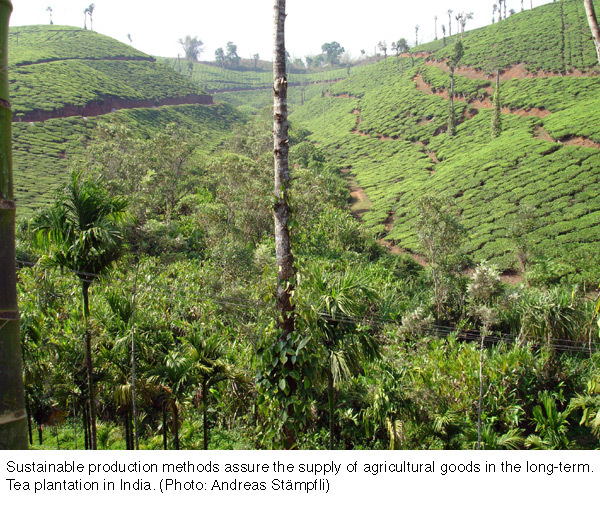 Source: Sustainable Agriculture: From Common Principles to Common Practice. Fritz J. Häni, László Pintér and Hans R. Herren (Eds.). Proceedings and outputs of the first Symposium of the International Forum on Assessing Sustainability in Agriculture (INFASA), March 16, 2006, Bern, Switzerland. International Institute for Sustainable Development and Swiss College of Agriculture. 2007. 262 p.
Community-based forest enterprises (CFEs) potentially have great scope to boost their contribution to development in countries that produce tropical timbers of often high value. Given that existing studies concentrate on only a few specific countries and regions, the International Tropical Timber Organisation (ITTO) commissioned a wide-ranging report on the subject. The market segments accessible to CFEs vary enormously. For example, CFEs in Mexico and Guatemala enjoy access to the high-value appearance-grade timber market as well as to commodity markets for construction-grade timber. Yet, for CFEs in more remote tropical regions like Brazil and Bolivia, logging is only financially viable if they process high-value timber. The impact which these have also varies considerably. In Cameroon, revenue from timber sales could be reinvested in housing, water, sanitation and electricity. Meanwhile in Tanzania, annual returns should eventually enable its forest conservation group to become independent of its donors. Nevertheless, the growth of CFEs in tropical countries will depend on their ability to overcome obstacles such as problems linked to market access, not to mention insecure tenure and use rights. Even though energy is not explicitly mentioned in the Millennium Development Goals, it is a widely acknowledged fact that sustainable production, supply and use of energy are very important factors for achieving all of the goals. The “Wisions” initiative supports innovative and sustainable projects in the energy sector, five of which are presented in this brochure. They cover a wide range of different areas of application, from mobile phone charging systems in Namibia and energy-saving cooking stoves for street vendors in the Philippines to combined cooking and water heating systems in the Indian mountain regions. In all of the examples, sustainability is achieved through adequate adaptation to local needs and the local environment. Low financial dependency after the start-up phase and good communication are other success factors. By contrast, difficulties can vary greatly from case to case. One example is that Philippine street vendors lack any legal status or work permit, which makes them vulnerable and prone to corruption. This concise, well-structured presentation offers a good overview at one glance. A list of contact addresses indicates where interested readers can obtain more detailed information. Source: Sustainable Energy for Poverty Reduction. PREP Brochure No 10. Wuppertal Institute for Climate, Environment and Energy. 2007. 16 p.
The motivation behind this impact analysis of the Social Forestry Support Program (SFSP) five years after it came to an end (1994–2002) is twofold. First, the Vietnamese government is seeking to reform all levels of education; to this end, innovative teaching methods developed by the SFSP could serve as models. Second, in Switzerland, citizens and politicians demand tangible results which they can bring to bear in debates on the impact of development cooperation. A range of analytical methods, including discussion groups and “storytelling”, were used to gather the opinions of various project participants. The research team found that participatory curriculum development, learner-centred teaching methodology, and participatory technology development have contributed to the formation of a human capital nucleus with not only the relevant knowledge and skills, but also sound and appropriate attitudes. These individuals have become catalysts for social development in the country generally, and continue to contribute more specifically to the development of social forestry. Impact analyses of development projects should be carried out more frequently, as their findings could help refine the direction of development cooperation. Source: Impact analysis five years after the end of the phase. 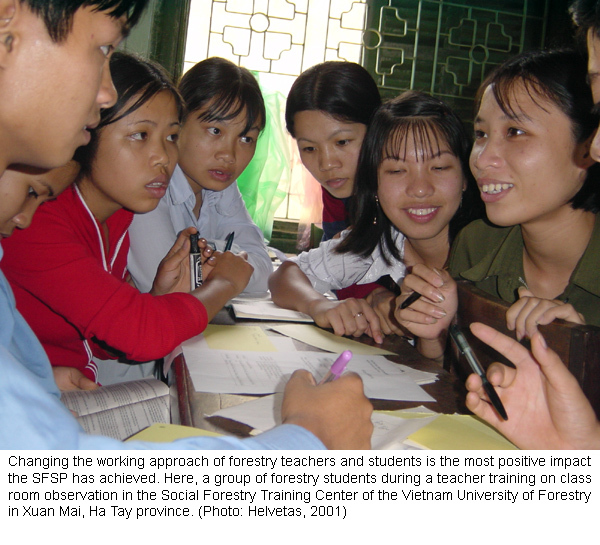 Social Forestry Support Program Vietnam (SFSP), 1994–2002. 2007. 31 p.
In 1999, after 2 years of negotiating, Kenya adopted a new water policy introducing several important innovations: The policy takes an integrative approach, involving all relevant ministries in dialogues on water issues. The Ministry of Water is no longer a direct service agency but carries a coordinating and supporting function. Decision-making has been decentralised, and the concerns of local communities, as well as those of women, are consistently taken account of. The objective is to achieve a development in water resources that is ecologically sustainable and contributes to reducing poverty. The participatory process starting when the policy was launched and leading to the implementation of the new, decentralised structure in 2005 posed a great challenge to all involved. However, the new political setting at the time favoured the reform process, as Mahboub Maalim, Permanent Secretary of the Ministry of Water and Irrigation, explains in an interview with InfoResources. Without the new government that came into power in 2002 and was open for change, the reform could hardly have been implemented in this stringent manner. Two years after the establishment of the decentralised structures, Mahboub Maalim sees first positive effects. The water sector is functioning more efficiently and is able to react more promptly to the concerns of the population. Communities are involved in water management, and water users contribute financially to the water sector according to a graduated tariff structure. In autumn 2007 the Permanent Secretary was confident that the new structures are stable enough to persist in a changed political environment. Earlier than expected, the time has come for this to be proven. Source: Interview with Mahboub Maalim, Permanent Secretary of the Ministry of Water and Irrigation, Kenya. InfoResources, Sept. 2007. 5 p.